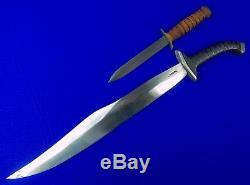 US WW2 WWII Custom Hand Made LEO BAKER One of a Kind Huge Theater Fighting Knife. Original US WW2 Custom Hand Made LEO BAKER One of a Kind Huge Theater Fighting Knife. Standard US MK3 knife is not included , used for size comparison only. The blade is 18 5/8. Listing and template services provided by inkFrog. The item "US WW2 WWII Custom Hand Made LEO BAKER One of a Kind Huge Theater Fighting Knife" is in sale since Thursday, May 24, 2018. This item is in the category "Collectibles\Militaria\WW II (1939-45)\Original Period Items\United States\Edged Weapons".